Hint: If you want to be vague, the answer is "sonogram". As anyone who has the (mis)fortune to know me personally has probably discovered, I like to argue about science as a means to get the best answer to a question. This was instilled in me during my first first college level science class at the University of Maine at Machias-by a professor that both scared the crap out of me and made sure we knew that every topic in science is evolving, our knowledge never stagnates-and that's what is exciting about it! Nobody has all the answers but we all have a small piece and together, through trial and error, we can come up with solutions to fabulously complex questions. Incidentally this is the same professor who, on my first day of college, I pointed out was incorrect about the fact that salt water boils at a lower temperature than fresh (it doesn't). He called me in front of the class during the next lecture to correct his mistake, and embarrass me at the same time (had that one coming). So, *ahem* a few years later, it appears that I have failed to learn from my earlier experiences, as the other day I got in an argument with a P.I. (principle investigator, or slightly better paid and more respected researcher) about acoustics terminology. He was speaking with his students about creating "sonograms" of bird calls. I imagine my reaction is the word is similar to when a grammarians hear someone say, "His head, like, literally exploded". Odds are, it didn't. I greatly dislike the term because, as we shall see, sonogram may refer to any number of things while spectrogram is quite specific. Unfortunately, I failed to convince my superior that he should change his terminology, perhaps due in part to a sudden stroke of conscience, "Maybe it's not a good idea to suggest to someone who has some influence over your future, that he's wrong". So, instead I shall tell the internet and maybe we can all learn something new in the process. By means of addressing these questions, in the following I will discuss the history, similarities and the present use and misuse of the two terms. I have discussed spectrograms before but this post will be more history-oriented. So, finding that no major deity of prophet provided reasonable answers to the above question, I resorted to flawed but more descriptive sources, scientific literature. (Wo)man's work. As a non-history buff as well as a not-birder, it's likely I may make a mistake. In which case feel free to post corrections (with citations) or links to anything you think I've missed. The earliest paper I could find including the term "spectrogram" or "spectrograph" was from 1932. In that paper the authors looked at light absorption on Venus. However, we are only talking about sound here so I'm excluding this from the paper count. The oldest paper I could find relating to spectrograms as a sound analysis tool dated from 1946 by Koenig, Dunn and Lacy (badass paper btw). To my knowledge this is the first paper that talks about spectrograms in the context of time, frequency amplitude representation of sound. The guys that made this model came out of Bell labs, the very same lab that invented the transistor, synchronized audio-video play (e.g. TV) and developed decibel scale for the sole purpose of annoying the crap out of acousticians for generations to come. Koning et al. (1946)* were looking to find a way to represent sound waves that changed in frequency as well as in amplitude. Working for the telephone company they were most interested in human sounds. They stacked 200 oscillograms (frequency spectrum at a single moment) of human speech side by side to try to understand how to visually represent the sounds of the English language. Besides the fact that it pertains directly to the question we are asking, it's worth mentioning for the simple reason that authors made a wooden model of a spectrograph. So cool. 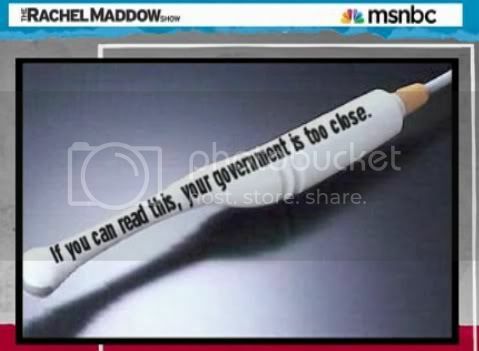 Next lab arts and craft project-decided. In fact, they were looking for a way to recognize words from the spectrographs, perhaps as an early speech to text. Unfortunately, they were not able to achieve that goal. It would be another half-century until the technology to caught up. What they were able to do is create a new way to visualize sound that includes both changes in amplitude, as seen in a waveform, and the spectral (frequency) content. This was a pivotal method to the study of biacoustics. Old homework output (seriously). Spectrograms combine waveforms (left) and spectrums (right-ish). Looking at the waveform, can you guess what made this sound? Without a doubt, this paper is the first unambiguous use of the term spectrograph as it relates to sound and more specifically to biological sounds. The astute or OCD among you may have noticed that I said spectrograph, not spectrogram as posited (stated) in my original question. Unfortunately, I haven't been able to come up with a clear answer to why that is. What I did find was at some point, and it's not clear to me why, the term "spectrograph" was replaced by "spectrogram". However, "spectrographs" didn't pop out of existence like an electron. 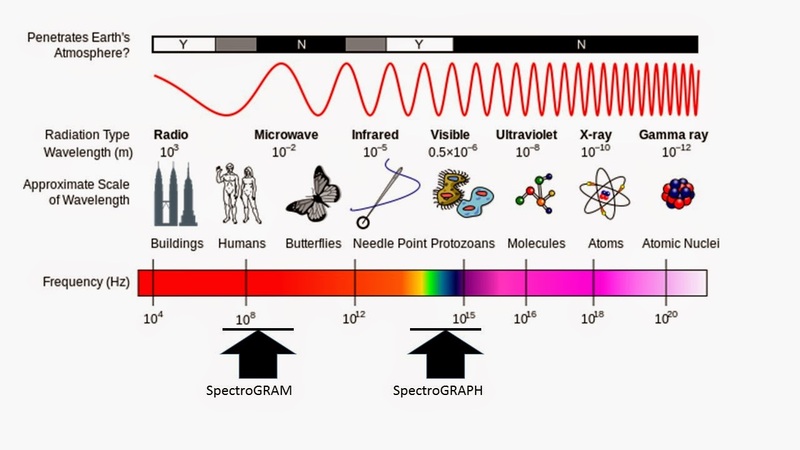 The term went on to describe tools that are used to separate light waves into their various components (wavelengths and colors) and to measure the relative amounts of energy of at each wavelength. This, is in fact, one way that the distance to the stars is estimated. From there out it appears the term spectrogram was used to describe the visualization of biological sound data. Over time, as digital signal processing techniques advanced and the Fourier transforms were made readily available definition became more linear. 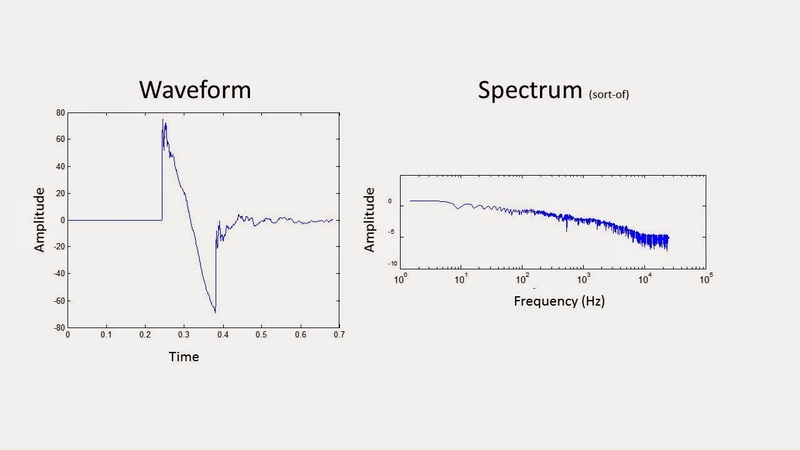 Now, spectrograms are used strictly to describe Fourier transforms of sound data. The below formula is a basic description of the equations that are are used to create a spectrogram, where t is time w is frequency and STFT is the short-time Fourier transform. The history of the term "sonogram" is less straightforward. I could find no scientific journal that defined the term, like there was for spectrogram or spectrograph. Historically, it's primarily been used to describe the images produced by medical ultrasound devices. But has, occasionally, been used interchangeably with spectrogram in the bioacoustics field. In contrast to the term spectrogram the earliest reference to sonogram as a means for analyzing biological sound was from 1956 by P. Marler, 10 years after Koeing laid out what a spectrogram was. Unfortunately I don't have access to the full paper so what I will describe is entirely from the abstract (brief summary at the beginning of a scientific paper). As with the Bell Lab guys, Marler was creating spectral representations of frequency varying biological sounds. 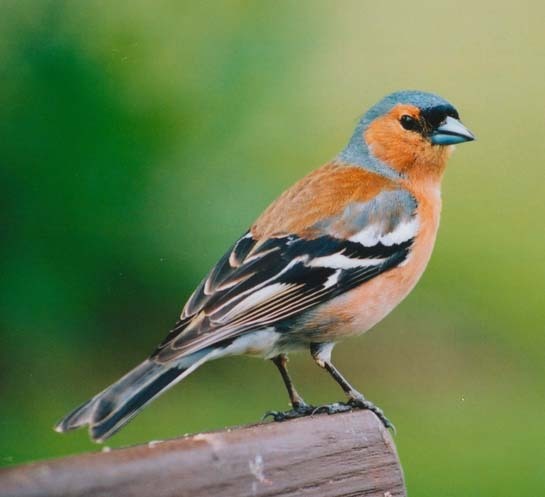 The abstract talks about the information encoded in chaffinch song and makes comparisons to human speech. Not being able to read the full paper it's hard to comment on the content much but it's fun to look at just how science ideology has changed over time. These days, it would be very unlikely that authors would make an outright comparison of bird song and human language. The change has come with the recognition that birds, bats, whales, insects etc. use sound to communicate in very different ways than humans do. In this regard, that is one of the things that makes humans special, we can use sounds to describe anything around us and convey abstract ideas, such as math, art, strategy and all the other wonderful things we do. 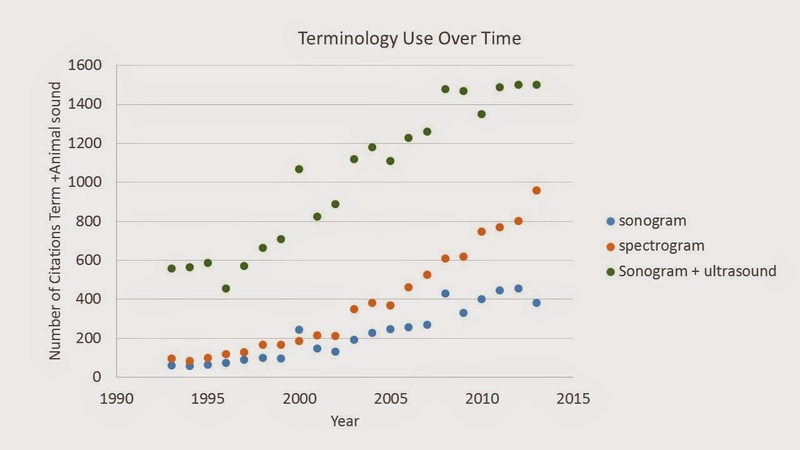 Since I couldn't find a clear definition for when the term "sonogram" first entered the literature, I thought it would be fun to look at how it's use has changed over time. A Google scholar search of "sonogram" + "animal"+ "sounds" indicates that, during the 70's and 80's the term became popular to describe spectrograms. The 5,980 search results covered sound production from animals as diverse as cicadas to fin whales. 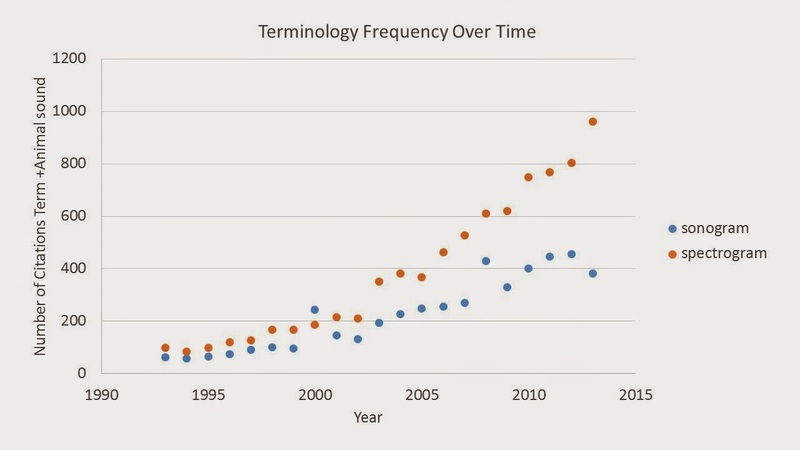 I wanted to know if the term was "sonogram" was becoming more or less prevalent in the scientific literature so I did restricted searches of the above terms and plotted the output over time. As you can see, in the mid 1990's both terms were used with roughly the same frequency. However, as time has gone on, the percentage of the scientific literature that uses spectrogram rather than sonogram has increased. It's impossible (with the amount of effort I'm willing to put into this question) to determine if that's because more people are publishing about bioacoustics or the term sonogram is becoming less popular. It is undeniable that the term sonogram is popular in the bioacoustics field, accounting for about a fourth of the citations with "spectrogram" or "sonogram" +animal sounds. Therefore, we can't say that it's entirely incorrect to use by means of a popular vote. However, lets look at one more thing. How often is "sonogram" used in combination with "ultrasound"? Ultrasound, as I'm sure you all know, refers to both sound frequencies above our hearing range and medical imaging by using the echos produced by a transducer applied to moist skin. As you can see, "sonogram" is MUCH more commonly associated with medical imaging than animal sounds. So, what have we learned? First, that the terms sonogram and spectrogram are still popular in the scientific literature. For this reason you cannot necessarily say that sonogram is incorrect when referring to spectrograms. However, the term sonogram is associated with medical procedures far more often than it is associated with the spectral representation of sound. An interesting side note worth mentioning is that MS office does not recognize spectrogram as a word (my screen is covered in red) but does recognize sonogram. Alternatively, the term spectrogram is a function within MATLAB (high power software often used to analyze sound) that returns, oddly enough, a spectrogram of inputted linear data. Type sonogram on the same platform and you get a screen full of red errors. Finally while the history of the term sonogram is unclear, there is a clear history of using spectrograms to represent the spectral content of biological sounds over time. Very helpful and thorough. Thanks for doing this. I will use "spectrogram" for bird songs now. The Terror That Quacks in the Night: Night Flight Calls!